Position a rack in the middle of the oven and heat the oven to 300 degrees F. Lightly butter the bottom of a 9x2-inch round cake pan and line it with a round of parchment. Lightly butter the parchment and the sides of the pan and dust with cocoa powder. Tap out any excess. Melt the chocolate and butter in the microwave or in a medium metal bowl set in a skillet of barely simmering water, stirring with a rubber spatula until smooth. Remove the bowl from the water bath and set aside to cool slightly. In the bowl of a stand mixer fitted with the whisk attachment, combine the eggs, sugar, vanilla, salt, and 2 tablespoons water. Beat on medium high speed until the mixture is very foamy, pale in color, and doubled in volume, 2 minutes. Reduce the mixer speed to low and gradually pour in the chocolate mixture. Increase the speed to medium high and continue beating until well blended, about 30 seconds. Add the cocoa powder and mix on medium low just until blended, about 30 seconds. Pour the batter into the prepared pan. Bake until a pick inserted in the center comes out looking wet with small gooey clumps, 40 to 45 minutes. Don't overcook. Let cool in the pan on a rack for 30 minutes. If necessary, gently push the edges down with your fingertips until the layer is even. Run a small knife around the edge of the pan to loosen the cake. Cover the cake pan with a wire rack and invert. Remove the pan and parchment and let the cake cool completely. The cake may look cinched in around its sides, which is fine. Transfer to a cake plate. Cover and refrigerate the cake until it's very cold, at least 6 hours or overnight. Melt the chocolate and butter in the microwave or in a medium metal bowl set in a skillet of barely simmering water, stirring with a rubber spatula until smooth. Pour the warm glaze over the chilled cake and, using an offset spatula, spread the glaze evenly to within 1/4 inch of the edge. Refrigerate the cake until the glaze is set, 20 to 40 minutes. 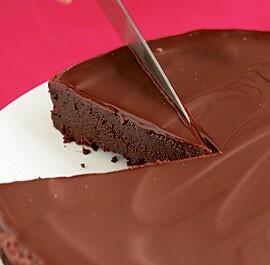 Before serving, remove the cake from the refrigerator and let it come to room temperature, 20 to 30 minutes. To serve, cut the cake into small, if not tiny, slices using a hot knife.